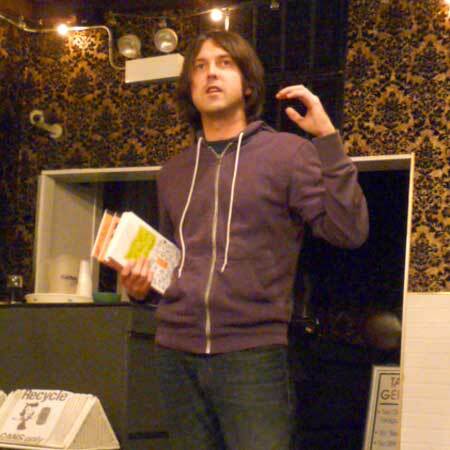 Patrick Shaffner of the Boring Store and 826CHI: The secretary avows knowledge of his actions. Any member can run for office as EVA president, vice president, secretary or treasurer, president Greg Nagel noted in his Feb. 6 opening remarks. (The exception: Members running for or holding political office.) A nominating committee of Neal McKnight, Stephen Rynkiewicz and Tom Tomek will propose a slate. "It's a great opportunity to get involved," said Nagel, who is standing down as an EVA officer but has joined the Wicker Park Bucktown Chamber of Commerce zoning committee. New volunteers have allowed EVA to address school and crime issues, Nagel said. The Boring Store sells secret agent gear  at least that's the cover story. Just don't call it the Secret Agent Store and threaten the mission, claims owner Patrick Shaffner. Investigation reveals the storefront at 1331 N. Milwaukee Ave. as a front for tutoring lab 826CHI. Its operatives run free creative writing workshops for ages 6 through 18. EVA members spied Shaffner with the evidence: books plotted by grade-schoolers, including the adventure novel "Anywhere at Once." The mission is supported by store proceeds and fund-raisers such as the Scrabble for Cheaters Tournament. A Boring Store gift gave Local First Chicago executive director Suzanne Keers cool-auntie cred with her 13-year-old niece. McKnight offered an unsolicited yet mysterious testimonial about his children's 826CHI assignments: "They get exposed to things about the city they don't get in school." 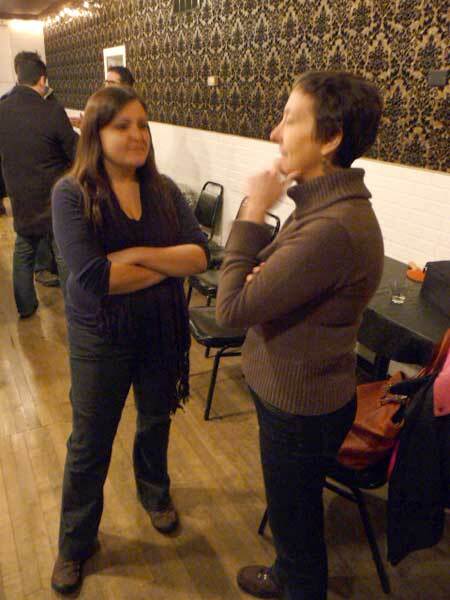 Suzanne Keers, right, of Local First Chicago, learns from a visitor about Cash Mobs. "Communities operate most effectively when problems are solved at the local level," Keers told EVA members the night before a strategy summit of Local First Chicago's neighborhoods initiative. Chicago Neighborhoods First is assembling representatives of 30 organizations to set development, policy, retail and labor goals, said Peter Locke, an EVA member and Local First Chicago board member. Local First Chicago operates consumer campaigns to support local, fair and green trade such as family farming. "People in Michigan should not be eating blueberries grown elsewhere," Keers said. But in fielding audience comments, she conceded there's a vast middle ground of fair-dealing chain stores and short-sighted sole proprietors that might benefit from business-to-business outreach. Nagel moved and McKnight seconded a motion to support Local First Chicago, which passed without dissent. After consulting with board members, Nagel gave the West Town Chamber of Commerce limited support for Friday night expansion of the chamber's Do Division festival. The caveats are that that EVA is not setting a precedent and that the chamber address parking, school support and police presence. Nagel said EVA will follow up with the bar at 1935 W. Division after a paid solicitor circulated a petition for an outdoor patio. "Signature collecting is not in any way a substitute for a community's voice," Nagel said. The 1st Ward staff had no knowledge of the petition. In 2007 Ald. Manuel Flores sent the bar's owner and neighbors into Liquor Commission mediation. The City Council-endorsed aldermanic boundaries may be put in place within a year, McKnight said. The remap puts East Village in the 1st, 2nd and 27th Wards, despite an EVA request to consolidate the neighborhood within the 32nd Ward. Aldermen have pledged to work together on community concerns. Stephen Rynkiewicz asked for comments on EVA's website redesign, social networking additions and expanded e-mail newsletters. Scott Rappe restated EVA planning goals for development at Ashland and Division in a letter to Housing and Economic Development Commissioner Andrew J. Mooney. Ald. Proco Joe Moreno indicates he will support extending Chicago Avenue's pedestrian designation west to Damen Avenue. Ald. Scott Waguespack's staff is addressing Red Apple Convenience Store's use of the bus stop at 2000 W. Chicago Ave. for customer pickup. A Feb. 11 charrette will look for playground design ideas at 1148 N. Honore St., and the Boundary tavern will contribute a percentage of that day's receipts to the school. Membership meeting minutes: 7 pm at Happy Village, 1059 N. Honore St., adjourned 8:48 pm. Attending: Nagel, McKnight, Rappe, Rynkiewicz, Tomek, 17 sign-ins. Board meeting 6:30 pm Feb. 13 at Leona's Restaurant, 1936 W. Augusta Blvd. Submitted by Stephen Rynkiewicz.